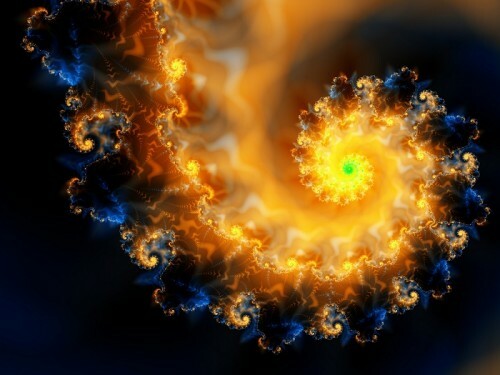 One example of a geometric cosmic blueprint might be a fractal spiral. What if I told you there is a blueprint of all creation? What if I told you this same blueprint – which is aka the fingerprint of God- connects all sciences, religions, mathematics and even you and me? What if I told you that, ‘our separation of each other is an optical illusion of consciousness’? But don’t take just my word for it, in fact, the last two sentences above, were actually quotes by, Isaac Newton, and Albert Einstein, on this subject. It is true, however, that these blueprints exist. In fact, it is the architecture of the universe. It manifests into and creates every form and formless thing. Giving the name it’s also known as, “the Fingerprint of God”. The same set of divine principles used to grow a flower is applied to the growth of a human baby after conception, and the ‘swirl’ of a galaxy, or the growth of a mountain. Witnessing this is literally looking at God/The Source/Creator’s fingerprints. But before I get into this semi long post, I want you to know the main reason I’m writing and posting this, which is to show and explain to you, that life is meant to be so much more, than commonly perceived and thought of. It’s supposed to be so much brighter and free from all these things boxing you in. You’re allowed and encouraged to think freely, question things, make strong eye contact with people and have genuine relationships, etc., as these are all important. So do so with what I’m about to tell you and hopefully with everything else in your life, as I have studied this subject for quite a few years now and I would love to share some of it with you! Sacred Geometry is this blueprint of Creation, I speak of, and in fact it’s the genesis of all form. It is an ancient science that explores and explains the energy patterns that create and unify all things and reveals the precise way that the energy of Creation organizes itself. On every scale, every natural pattern of growth or movement conforms inevitably to one or more geometric shapes. As you enter the world of Sacred Geometry you begin to see as never before the wonderfully patterned beauty of Creation. Viewing and contemplating these codes allow us to gaze directly at the lines on the face of deep wisdom and offers up a glimpse into the inner workings of the Universal Mind and the Universe itself. The ancients believed that the experience of Sacred Geometry was essential to the education of the soul. They knew that these patterns and codes were symbolic of our own inner realm and the subtle structure of awareness. To them the “sacred” had particular significance involving consciousness and the profound mystery of awareness ….. the ultimate sacred wonder. Many patterns are directly related to the geometric figures descended from Hebrew gnosticism and the Egyptian mystery school, commonly known as ‘sacred geometry’. When natural scientist Ernst F.F. Chladni (who lived during the time of Goethe,1756-1827) used a violin bow to vibrate glass plates covered with fine sand and in so doing discovered what were named after him as the ‘Chladni sound figures’, the formative force of vibration and sound, which had been recorded in so many old myths of the Creation and which was spoken about by so many philosophers of nature, became perhaps for the first time ever a phenomenon directly accessible to our senses. During the 1960s and 1970s, the Swiss doctor Hans Jenny managed to considerably expand this approach with new test conditions and through the use of a very wide range of materials and, in particular, by extending the method to encompass vibrating fluids. He was therefore able to display numerous fascinating images of the sound figures which he combined under the name of ‘Cymatics’ (from the Greek word ‘to kyme’: the wave). This discovery proved exactly how sound could influence and create matter and form. Sound familiar? “Hopefully you see the connections to God SPEAKING the cosmos into existence, or in the beginning was the WORD… Do I really have to spell all those connections, out for you? Sacred geometry can be described as a belief system attributing a religious or cultural value to many of the fundamental forms of space and time. According to this belief system, the basic patterns of existence are perceived as sacred, since contemplating one is contemplating the origin of all things. By studying the nature of these forms and their relationship to each other, one may seek to gain insight into the scientific, philosophical, psychological, aesthetic and mystical laws of the universe. 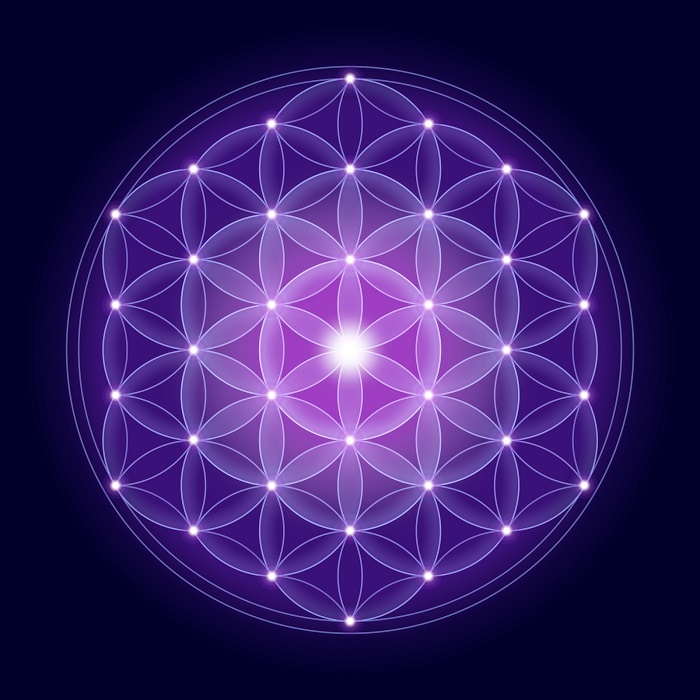 Flower of Life with, a spiritual symbol and Sacred Geometry since ancient times. The sacred geometry is in fact, the backbone of the larger Flower of Life, a sacred blueprint of all Creation. The pattern is also repeated in the Kabalistic Tree of Life and appears in most all early religious traditions in the Middle East. Used in religious art, it often represents the all-seeing eyes of God. The overlapping circles represent the omniscience of Creation honoring the infinite connections of all life circles, nurturing diversity. As a spiritual practice, use the Seed of Life to hold a morphogenic field of acceptance for all beings, all cultures, all beliefs, realizing that all circles rotate through the center of creation, and thus establishing the holiness of all orientations. In a larger context, the Seed of Life resonates tolerance and infinite source energy for all beings. Placed on water, the Seed of LIfe will be a silent reminder of your place in the web of creation. Matter itself is made of atoms which are all tiny oscillators vibrating in the structure of the vacuum and are each made of 99.999999% space. By understanding the structure and dynamics of space we can better understand everything in the universe. Everything exists by vibrating in response to a specific tone; like how from silence there can only be noise. Each vibration gives off a unique frequency which affects all unique bodies differently. These vibrational frequencies are interpreted by the senses which give associative attributes, like color, texture, shape, movement, energy, polarity etc. to all oscillating forces or existing energies. These interpretive sensations are variables of space and time, and work to form our perception of our own unique reality—like this post right here. All bodies have, emit and receive, frequency whether they be material, etheric, or both; like you and I. This is not a trivial theoretical matter. The more aware = the higher the frequency = the healthier the environment = the more compassion = the less pain. It’s time to tune our biology and our consciousness to resonate with the fundamental harmonics of the universe. that is not interconnected with everything else. Nothing. and they combine to form this universal order. There is only one universe made up of all things, and one Creator who pervades them; there is one substance and one law, and all truth is one. The One divides into the Many, in order to experience the Many as the One. It’s all well and good but why do you need a conscience creator? Can’t it all arise spontaneously ? The creator is conscious because everything is conscious; everything is conscious because the creator is conscious. Spontaneity only exists in the mind, the rest is cause and effect.